Charles Norris lived at 47 Summerstown, a fascinating address of immense historical significance. Some time before the Norris family located there, it was the site of a beer house called The Sir Jeffrey Dunstan. The road was well catered for on the refreshment front with two public houses at either end, but how useful to have somewhere that a thirsty punter could slake their thirst if they happened to be half way down the street and find themselves in need of a drink. It seems very appropriate that in the face of extraordinary change on this road, its still the case today. 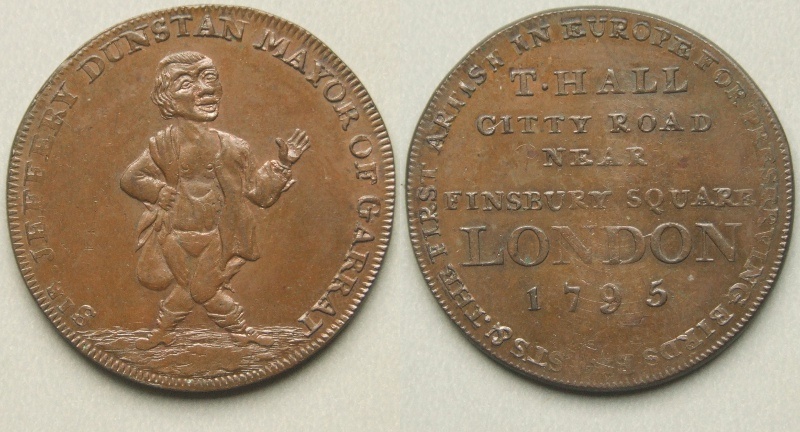 Jeffrey Dunstan was without doubt the most famous ‘Mayor of Garratt’. 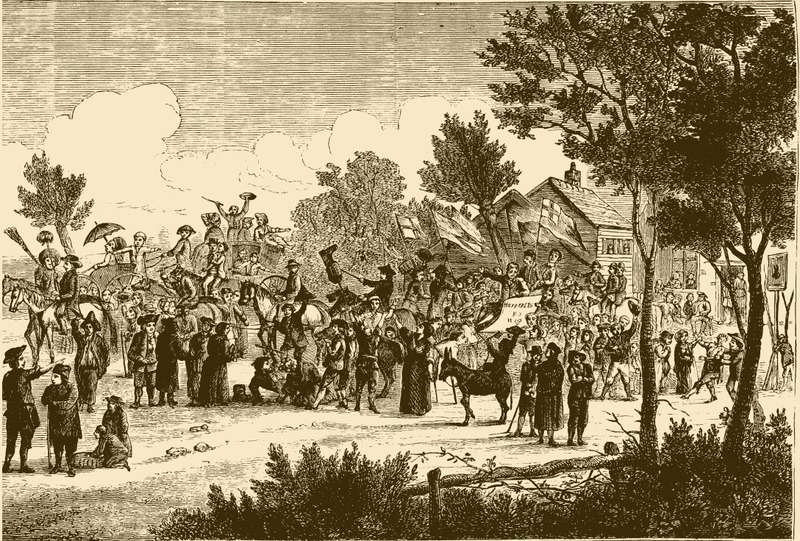 A popular chaotic annual gathering was based around a mock election which took place on Garratt Green for over half a century dating from about 1750. Jeffrey was a larger than life secondhand wig salesman from Southwark. Bought up in a workhouse, he was four feet tall and knock-kneed with a disproportionally large head. An account from the time describes him as having ‘a countenance and manner marked by irresistible humour, and he never appeared without a train of boys and curious persons whom he entertained by his sallies of wit, shrewd sayings and smart repartees’. 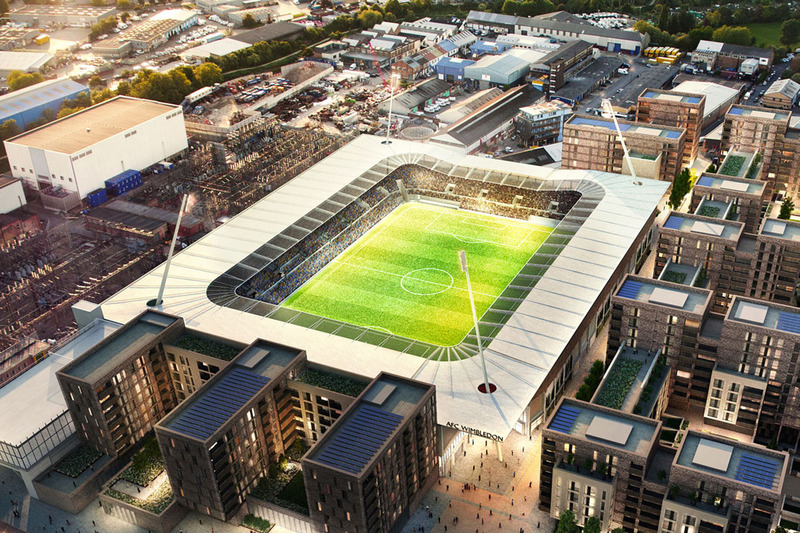 Gatherings on the Green attracted up to one hundred thousand people to the locality, clogging up the roads and engaging in a scale of bawdiness and revelry that puts the possible return of AFC Wimbledon to Plough Lane into perspective. Supposedly the tradition was started by some waterman after ‘spending a merry day at The Leather Bottle’ but the occasion was generally believed to have evolved out of some form of local protest at the enclosure of public land. The candidates for Mayor were usually poor tradesmen, quite often with a drink problem and sometimes a physical deformity. The main qualification was a quick wit. A bizarre procession usually started in Southwark, wended its way to Wandsworth before moving down Garratt Lane. A little too fond of his drink, Dunstan died afer a bizarre boozing session in 1797 apparently in the act of being pushed around in a wheelbarrow. The French Revolution and increased radical agitation meant that the authorities cast a sterner eye over the rowdiness of the Garratt elections towards the end of the century and they fizzled to a halt in 1804, though there was briefly a revival in 1826. Around 1850, Robert Sadler, not long after the proprietor of The Lost Copenhagen Running Grounds, was managing the Sir Jeffrey Dunstan. It was owned by the Young and Bainbridge Company which eventually evolved into Youngs Brewery. He soon brought two of the cottages next door. The notice of sale remarked on the presence of an artesian well in front of the property which residents all had access to. His back garden would just a few years before have been the route of the famous Surrey Iron Railway, the world’s first ‘iron railway’ on which horse-drawn wagons took coal from Wandsworth to Croydon. The Sir Jeffrey would later become a coffee shop and finally a second hand shop before being demolished in the late sixties. The below photograph was taken in 1914 looking up the road in the direction of The Corner Pin. The building with the tall chimney was known as Gothic Lodge and the Norris home would have been some way further up the street to the left of it. Charles Norris was born in Merton in 1890. One hundred years after the last Mayor of Garratt but with the memory of Jeffrey Dunstan still alive, his family located to Summerstown, first to Foss Road and then to the site of the beerhouse halfway down the road, facing what is now the car-park expanse alongside Wimbledon Stadium. We know that in 1916 Mrs Alice Norris, a widow was living there upstairs with at least two of her sons, Alfred and Arthur and a daughter Mary. Downstairs was a shop run by an Elaine Millar. In the space of a year, a cruel double blow was landed on Alice. Charles was killed near Ypres and almost a year to the day later, another older brother William, on leave from 3rd East Surreys threw himself under a tram in Garratt Lane. The court recorded a verdict of ‘suicide whilst temporarily insane’. Charles was in the famous 2nd Battalion of the East Surrey Regiment which in 1915 was boosted by the intake of a huge local Wandsworth recruitment drive. His service record indicates that he had been in and out of the army since August 1908 and a full-time solider since 28th April 1911, when he transfered to the 1st East Surreys. His tangled records indicate that he served in Ireland, Burma and India. He appears to have returned home on 19th November 1914, possibly as a result of suffering from skin problems while overseas. It would seem he was then sent to France with 2nd East Surreys on 19th January 1915. He sounded like a distinctive character, with tombstones and horse’s head tattoos and a prominent scar on his cheek. His records also indicate that he achieved proficiency as a ‘first class shot’. At the time of his death he was 25 and had been promoted to the rank of Lance Corporal. Charles was killed on St Valentine’s Day 1915, less than a month after arriving in France. 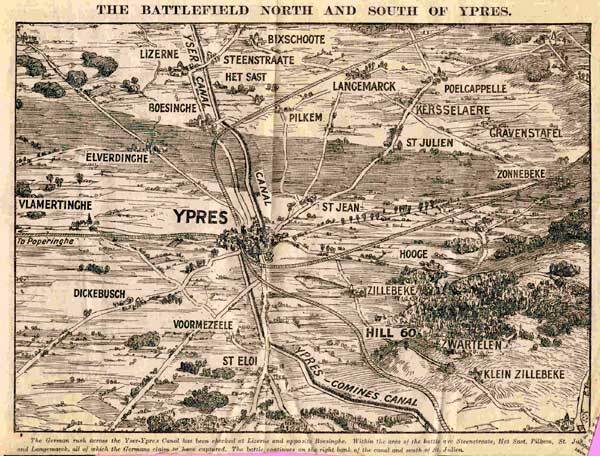 The 2nd East Surreys were south of Ypres and having moved to the front line in February became involved in attempts to capture a much-prized German stronghold called Hill 60. This was a 150 foot high, 750 foot wide spoil heap created by earth dumped from the creation of a nearby railway cutting which provided observers with an excellent view of the Ypres area. Captured by the Germans during the First Battle of Ypres in November 1914, it was taken briefly in April, but lost again shortly afterwards. It remained in German hands until the great Battle of Messines mine assault of June 1917. 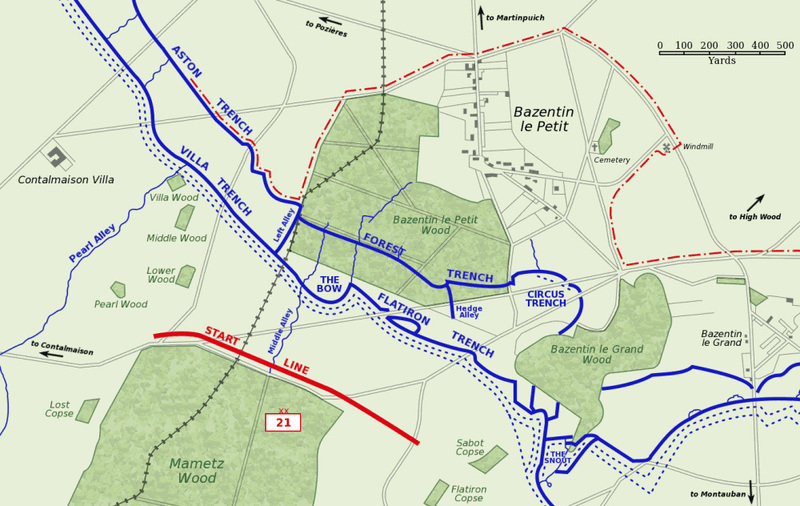 In February the French were in charge of the efforts to take Hill 60. On Sunday 14th February at 2pm, the 2nd East Surreys set out with the objective to capture a lost trench on the southern side of the Ypres-Combines canal. The War Diary records how the attack was over open ground and very exposed. Chris Burge has researched this disastrous attack which saw the loss of Charles Norris and fellow Summerstown182, Lance Corporal William Smith from Bellew Street. Surprisingly not on the St Mary’s memorial, is another local lad, Fred Sorrell from Khartoum Road. He had also served extensively in India and was very likely known to Charles Norris. A and C Company lost nearly all their officers. Eight rank and file were killed, 106 wounded and significantly 37 listed as missing. 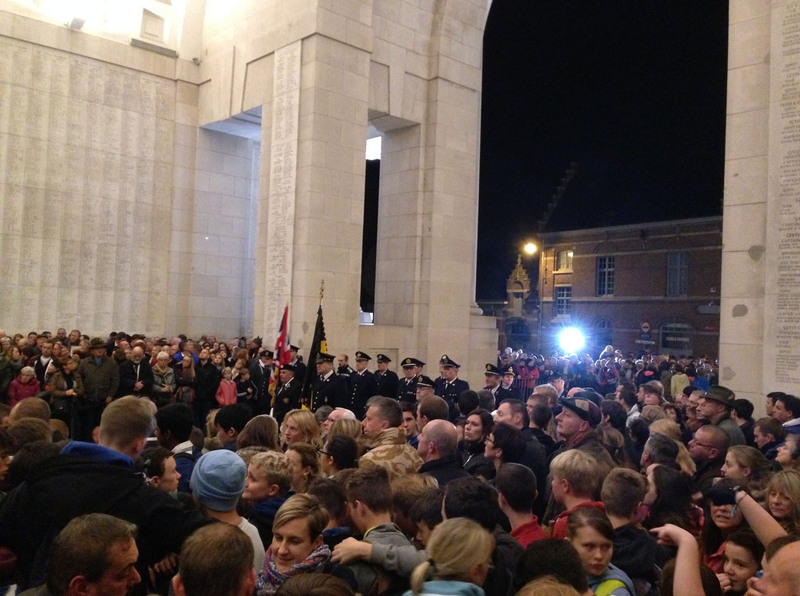 In total 44 men from the East Surrey Regiment lost their lives that day and only five have known graves, the remainder like Charles Norris are remembered on one of the grand white marble panels of the Menin Gate in Ypres and photographed when we visited the Ceremony there last Saturday evening. The diary records the death of 2nd Lieutenant Ernest Bernie who was shot in the chest on 14th. His last reported words to his sergeant were ‘Sergeant Oliver, cheer the platoon up and look well after them. Goodbye, I have done my best’. Back home, all has changed utterly on the historic road which was once the centre of the original settlement at Summerstown. 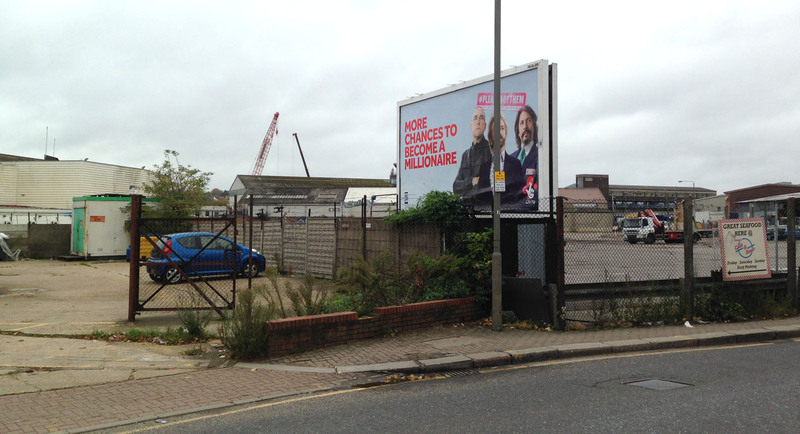 Now it runs wearily alongside Wimbledon Stadium, anxiously awaiting what next will be thrown at it in the name of progress. The only survivor of the five pubs is The Corner Pin. 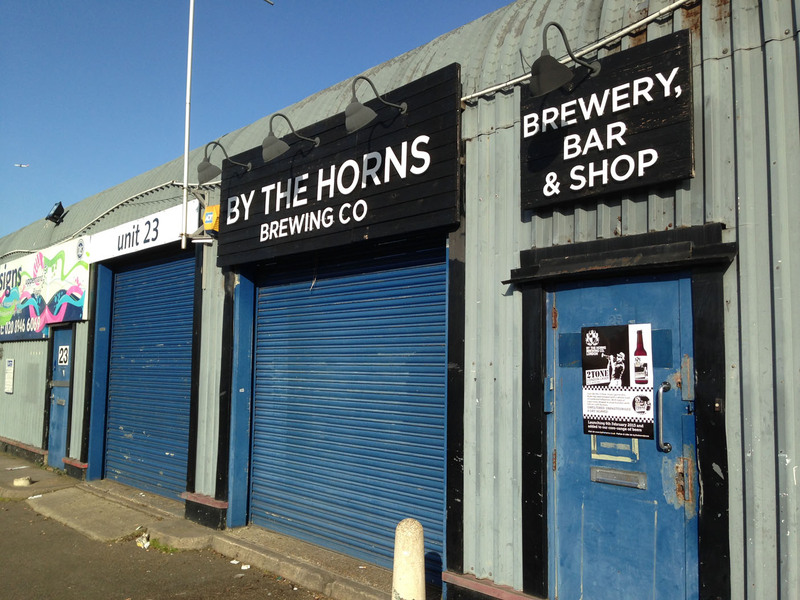 The numbering on the road has changed several times and the site of the Sir Jeffrey Dunstan at what was No47, is now very appropriately an award-winning micro-brewery called By the Horns. They open their doors most days and where better to spend a lazy summer’s evening than kicking back with a bottle of ‘The Mayor of Garratt’. You can watch the sun set over the dog track and drink to the Norris brothers and Jeffrey Dunstan who in very different ways served this area so magnificently, many years ago. Many thanks to Kevin Kelly whose book ‘Robert Sadler and the Lost Copenhagen Running Grounds, Garratt Lane, Wandsworth’ provided much insight to help tell this story. Also Chris Burge for his extensive research of Charles Norris’ army service records. Frederick Sizmur Buckland is remembered in Summerstown and Mitcham. 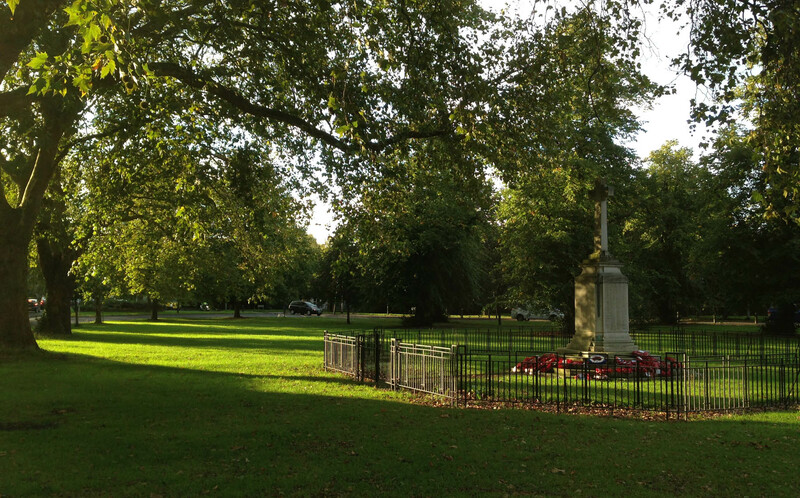 Chris Burge’s special guest blog is the most comprehensive account of the war experience of a Summerstown182 soldier that has been written to date. Sunday July 16, 1893 was a happy day for the Buckland family, as their one month old son was baptised ‘Frederick Sizmur Buckland’ at St. Nicolas Church, Tooting. To his parents, Bertie Edward and Jemima Jane (nee Oulds), Frederick was a special blessing as only the year before they had lost their infant son Leonard. 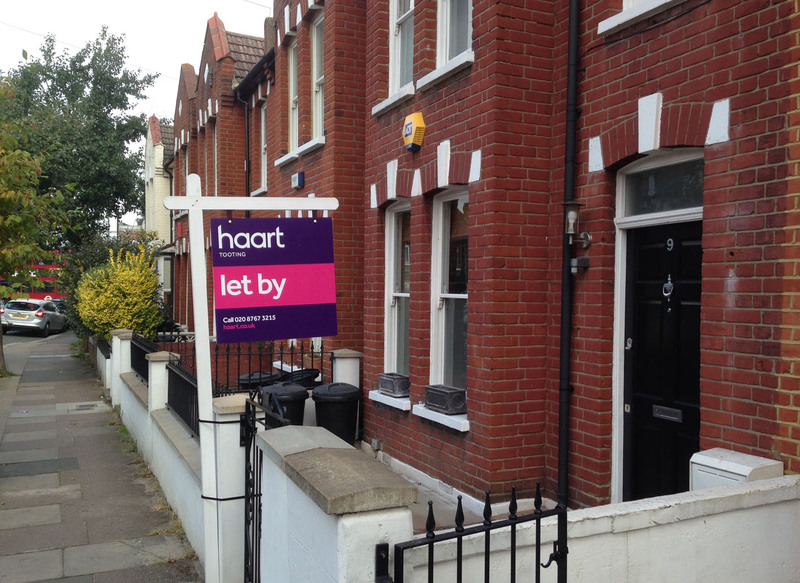 Vant Road, Tooting, was Frederick’s first home, close to the Mitre Pub and the ‘Tooting Pump’. 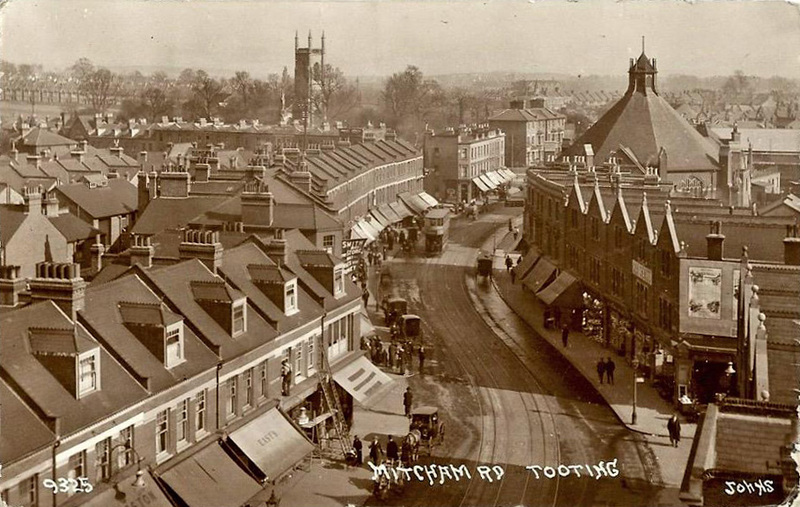 Before the turn of the century, Tooting still had an atmosphere that was more village than suburb. There would be much change in the decades before the Great War. 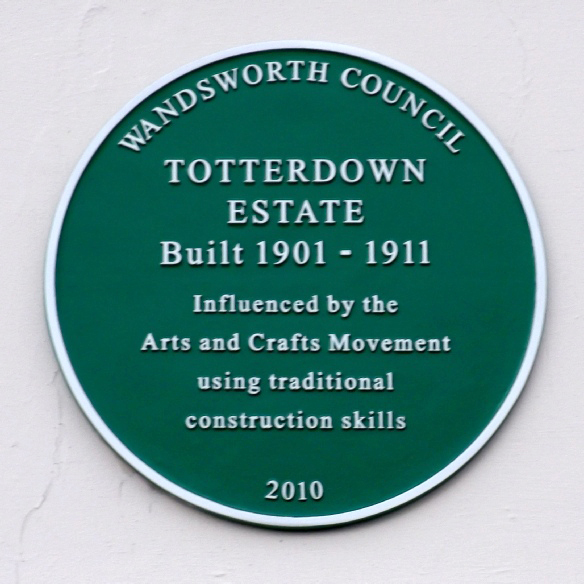 Houses replaced open spaces and the vast Totterdown Estate would be built between 1901 and 1911, bringing an influx of new residents. 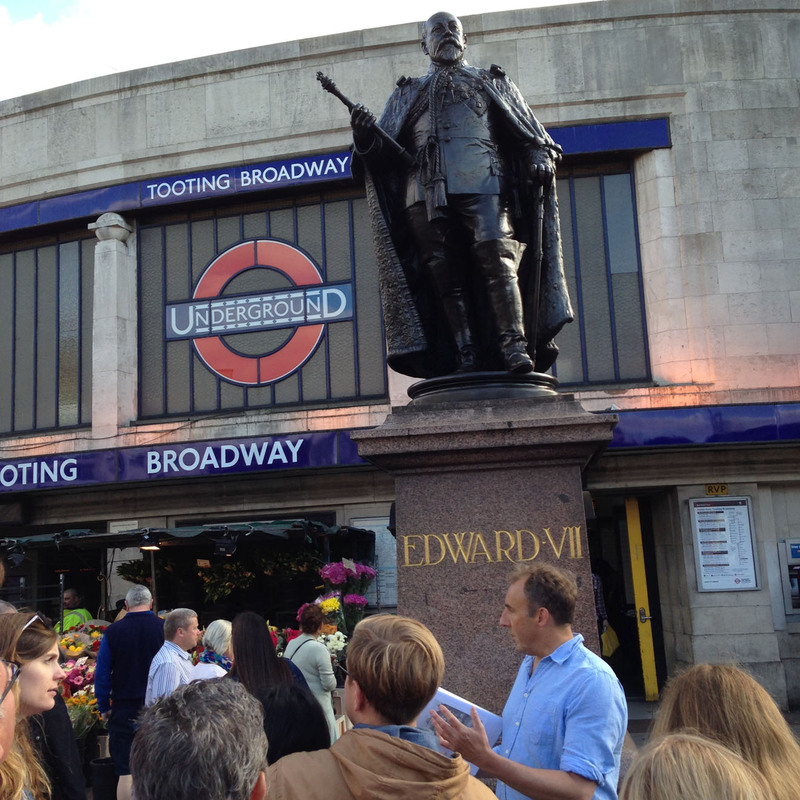 One of the first electric tram services would come to Tooting in 1903, a cheap and popular form of transport that fostered the growth of suburban life – work and home need not be close by. Mitcham Road became a centre for increasing numbers of shops and businesses and the former landmark of the Methodist Central Hall was built in 1909. 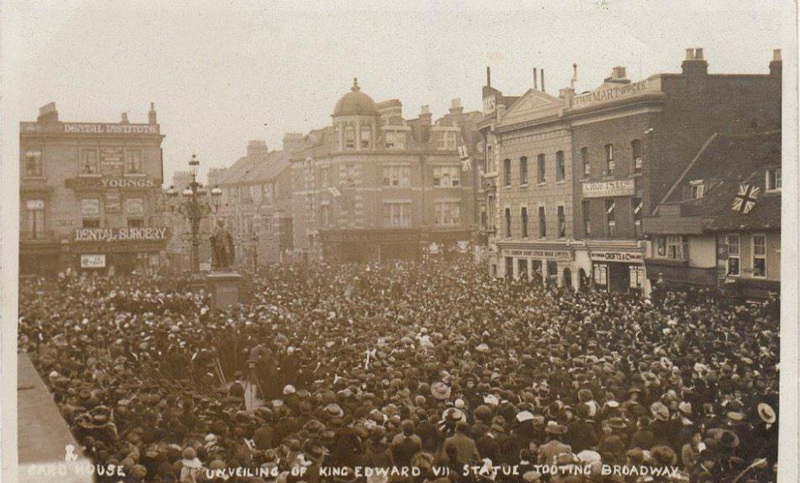 In 1911 a huge crowd turned out at Tooting Broadway to see the official unveiling of a statue to King Edward VII. It had been paid for by public subscription. But the Bucklands had decided to leave the bustle of Tooting, and by 1911 had been living in Summerstown for around ten years, first in Huntspill Street and then at 44 Wimbledon Road. They lived on the doorstep of St. Mary’s Church, where several of their children were baptised. At birth Frederick was one of four children, but there had been many additions to the family over the intervening years and by 1911 Frederick was one of ten siblings with ages ranging from 24 to the newly born. The family group would certainly make an impression at St. Mary’s Sunday services. Frederick’s older brother, Francis George, was the first of Bertie and Jemima’s childern to marry. It was the summer of 1913, just a year before the outbreak of war, when he married Ruby May Cordrey who lived in Southfields. They would later live in Garratt Lane and Mitcham. By the outbreak of the War, the Buckland family had moved again and where now living at 75 Marlborough Road, Colliers Wood. This would be their home until about 1930. They would probably have described themselves as ‘comfortable’. Frederick’s father had been in constant employment for over 30 years as a skilled craftsman, working as a gold and silver embosser and modeller since being apprenticed as a ‘silver chaser’ by the age of fourteen. The War would bring new challenges and heartache to the Buckland family. Bertie Edward and Jemima would worry that their three eldest sons, Francis George aged 25, Clifford Harold aged 23, and Frederick now 21, could all be dragged into this war. Frederick, like so many others, answered the call for volunteers in 1914. Frederick’s Army service records did not survive the London Blitz of WW2, but significant information can be gained from the records of servicemen with Army numbers close to Frederick’s, along with other sources. Frederick’s Army number, 47076, corresponds to a group of Londoners that volunteered at the beginning of December 1914 at various locations in the City and elsewhere. They were all men who served in Brigades of the Royal Field Artillery (RFA) that would from part of the 21st Division in one of Lord Kitchener’s New Armies which was given the ‘triple seven insignia’. For example: 47015 a/Bmdr (later serj.) Ernest Shepherd MM, from Edmonton, volunteered on 2 Dec 1914, served in C/97th and D/96th Brigade RFA, wounded in 1917. 47031 Drv. Henry John Gutteridge, a carman from Hornsey, volunteered on 2 Dec 1914, served in C/97th and D/96th Brigade RFA, discharged unfit with Silver War Badge 01-May-1918, wounded in an accident. 47056 Drv. 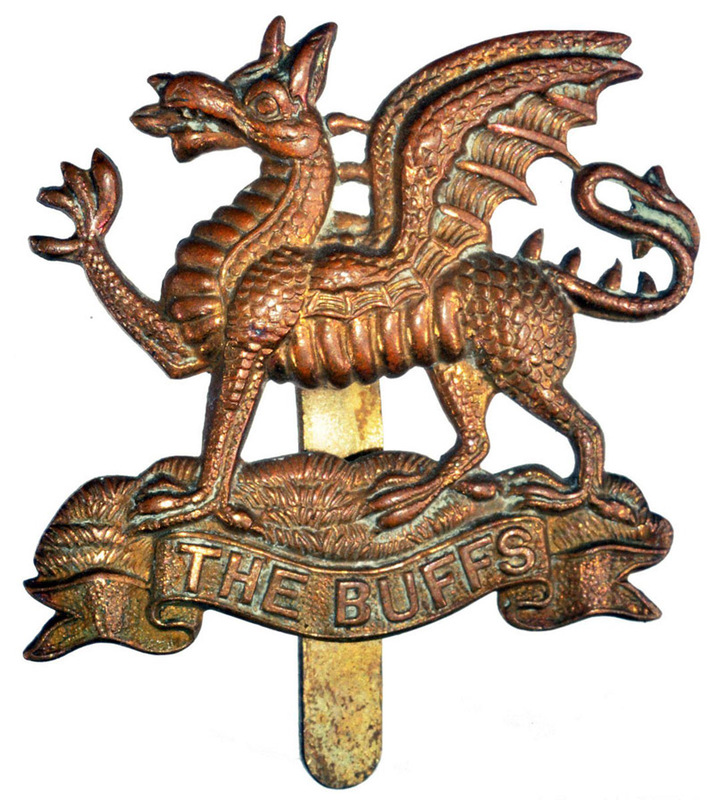 Sidney Arthur Peeke, a boiler tester from the Old Kent Road, volunteered on 2 Dec 1914, served in C/97th Brigade RFA. 47065 Drv. Alfred William Shuttleworth, a gardener from North Finchley, volunteered on 2 Dec 1914, served in C/97th Brigade RFA, lost a leg in the War. 47117 Sgt. George William Yenson MM, from East Ham, volunteered in early Dec 14, served in 97th and 94th Brigade RFA, discharged unfit 14-Feb-1919 with Silver War Badge). Frederick Buckland served in the ‘C’ battery of the 97th Brigade RFA (This became ‘D’ battery of the 96th Brigade in a re-organisation recorded in the Brigade’s War Diary of 1916). At this time RFA Brigades were organised in four batteries ‘A’ to ‘D’, each with six guns. In the case of the 97th Brigade, all the batteries operated howitzers, while the 96th and other 21st Division RFA Brigades operated 18-pounders. Manned by six men, and horse drawn, the howitzer had a maximum range of a little over 4 miles, firing a 35lb shell that would take roughly 30 seconds to reach its target. While shells were first either high explosive or shrapnel, both smoke and gas shells would be developed for the 4.5 howitzer during the war. By December 1914 the War was already bogged down, and after a desperate defence of Ypres the winter would bring a halt to major operations for the BEF. In the spring of 1915 there would be yet more fierce fighting in the Ypres Salient, with an ever growing need for men and guns. It was clear now that it would not be a short war. Frederick Buckland, and the other civilian volunteers of his RFA Brigade, faced a nine month training period, often arduous and often tedious. In this short time they were expected to master all aspects of artillery work: horses, wagons, limbers and guns, ammunition handling, observation, signalling and manoeuvres. And there was always the marching. In the early days, with little or no equipment, the men practised drill on dummy guns, it was not until the final weeks before departing for France that Frederick’s Brigade would be fully equipped with guns and horses. By now the 97th Brigade RFA of the 21st Division were at the sprawling Witley Camp, near Godalming in Surrey. A frenzy of activity for both officers and men brought Frederick’s Brigade to War readiness and they crossed the channel from Southampton to Le Harve on 10th September 1915 in three boats. If the ‘1915 Star’ medal rolls show his current rank when he first went overseas, Frederick Buckland must have been very proficient, as he had already been promoted to sergeant and would be No.1 of his gun detachment. After just two weeks in France, and with no trench or battle experience, both the 21st and 24th Divisions were thrown into the second day of the battle of Loos, a major British offensive, on the 26th September 1915. This would be a horrendous baptism of fire for the infantry of both Divisions. Tasked with a frontal assault in daylight without the cover of gas or smoke, the troops attacked the second German line, a series of well prepared trenches which lay behind thick belts of barbed wire that remained uncut. The ground was mostly open and flat, offering little cover and already strewn with the dead and dying of the previous day. At hill 70 they were attacking uphill. Frederick’s battery, and the other divisional artillery offered what support they could, but were mostly firing at ill-defined targets. There was a lack of proper trench maps, officers sent forward to reconnoitre were sniped at and the artillery was not able to provide close support for the attacking troops. The 21st Divisions infantry were simply cut down by machine gun and rifle fire, which for some units came from three sides and even from behind. Of the two division, there had been twelve battalions making the attack, in all close to 10,000 men. In the three hours or so, of that day’s action, the casualties were reckoned to be 385 officers and 7861 men. The men of Kitchener’s New Army had paid a heavy price. Frederick’s battery commander Captain G.E. Heath and 2nd Lt. R. St. G. Brooks were both killed when retiring from a forward position in front of Loos, they were caught by machine gun fire, and five NCOs were wounded that day. Frederick’s battery continued to engage the enemy as best they could over the next two days, themselves coming under repeated heavy shell fire. Further casualties were sustained by the battery on the 28th, including a group of six telephonists who were either all killed or wounded by enemy shell fire. The Battle of Loos would not end until 14th October 1914, but Frederick’s battery was withdrawn on the 1st of October and moved to the Armentieres sector were they remained until the spring of 1916. Back in Britain, few of the general public were aware of the disaster at Loos until alerted by the casualty lists and the rumours that circulated some weeks after the event. 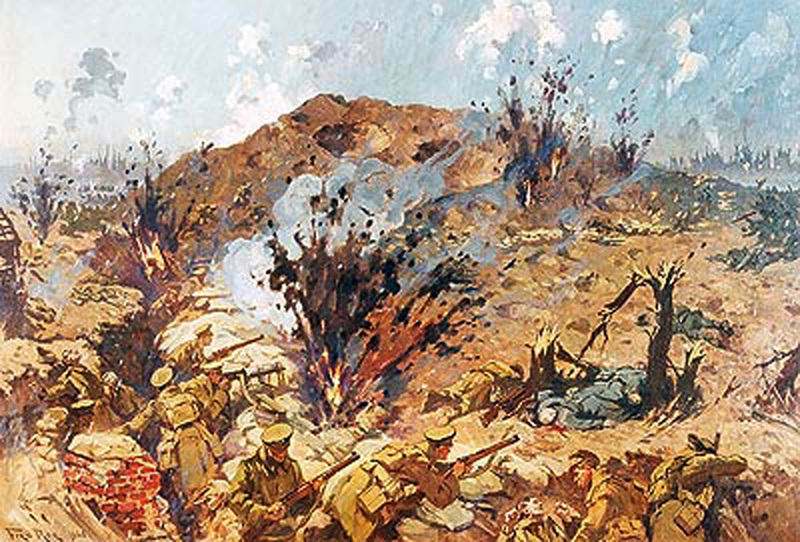 Whether the Buckland family received any news of the reality of the front is unknown, but there were rumblings about the need to introduce conscription as the number of volunteers decreased and the war dragged on. The Derby Scheme (properly called the Group Scheme) was introduced by Lord Derby in the Autumn of 1915 and offered a compromise. 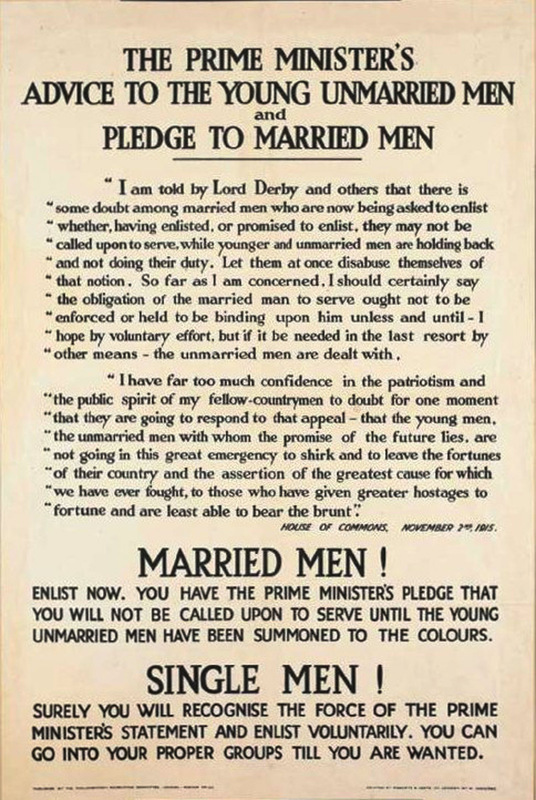 ‘Men aged 18 to 40 were informed that under the scheme they could continue to enlist voluntarily or attest with an obligation to come if called up later on. The War Office notified the public that voluntary enlistment would soon cease and that the last day of registration would be 15 December 1915’. This may have been the spur for Frederick’s older brother Ciifford Harold Buckland to volunteer. On 8th November 1915 he enlisted in the Royal Flying Corps in West London, but for reasons unknown he was discharged in a matter of days and there is no other record of him serving in the armed forces. Ultimately the Derby Scheme showed that there were too few volunteers to fill the ranks and conscription soon followed. The Military Service Bill was introduced in January 1916, providing for the conscription of single men aged 18–41. Every single man and childless widower between 18 and 41 was offered three choices: 1) Enlist at once. 2) Attest at once under Derby’s system. 3) Or on 2 March 1916 be automatically deemed to have enlisted. In May 1916 the bill was extended to married men. Now parents Bertie Edward and Jemima would see another son go to war, as Francis George Buckland was called up in the third week of May 1916. He was among a small number of men from the Tooting area assigned to one of the Royal Garrison Artillery’s Siege Batteries, who manned the heavy guns on the Western Front. In Northern France, Frederick’s howitzer battery moved to Dernancourt, just south of Albert. In May 1916 the 96th Battery was positioned at Bercodel, a little to the east of Albert. 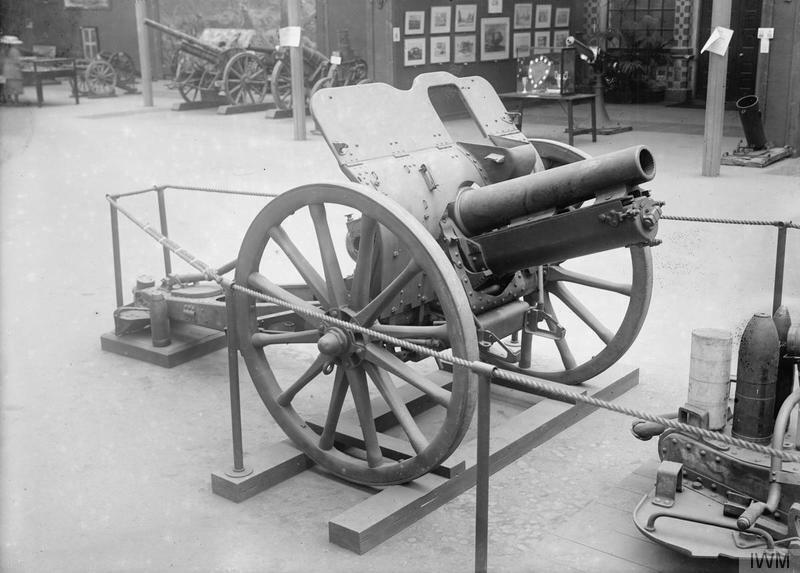 Around 15th May Orders were received from GHQ for a re-organisation, Frederick’s howitzer battery, c/97, was to be interchanged with ‘D’ battery of the 96th Brigade. Batteries of the 96th Brigade would spend much of May improving their positions, and especially the field telephone communications. It was obvious this was the build up to a ‘Big Push’ on the Somme. Gunners of the Royal Field Artillery, have a cigarette break at a 4.5 inch howitzer emplacement at Thiepval in September 1916. Note the ready 4.5 inch shells, with No 101 Fuses. 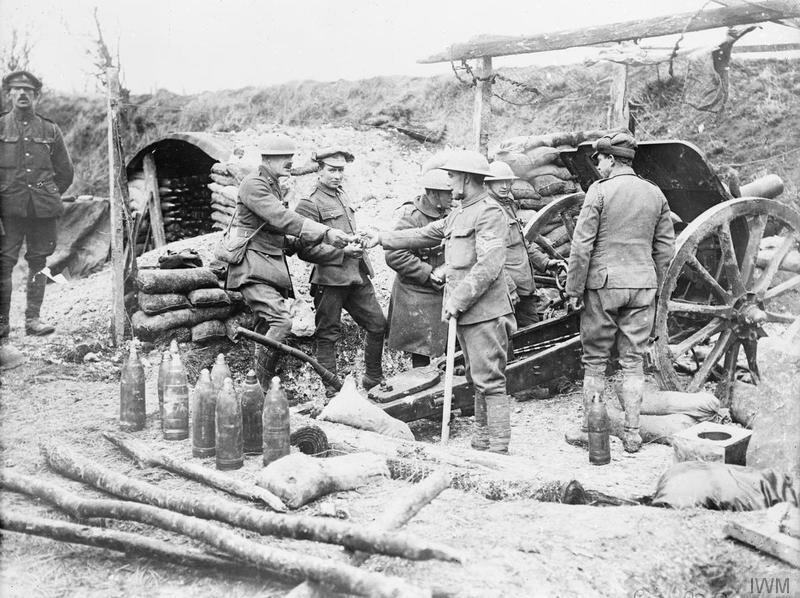 Frederick’s battery moved to its final position close to Becord by mid June, within shelling distance of the German trench system just north of Fricourt. All the while ammunition was transported by lorries and the light railway built to run from Albert as far as Becord Wood, before being manhandled up to the batteries. For Frederick and the men of ‘D’ battery, the battle of the Somme began at 4.30am on the 24th June 1916. The bombardment of German positions continued day and night. The gunners worked to a strict timetable which emphasised wire cutting in the first two days, before the destruction of trenches. The weather had deteriorated and the attack planned for 29th was postponed. The bombardment was extended until the 30th of June causing the artillery difficulty in adjusting rates of fire to rounds used. Observation was proving to be very difficult and reports from patrols gave a mixed picture of the success of cutting the German wire. On the night of 30th reports reached the 21st Division that machine guns were active from Fricourt Village. The high command had placed great optimism in a bombardment that would destroy the German line and its defenders, opposition was expected to be light. The reality would be very different for the attacking infantry. After a final crescendo in the proceeding 30 minutes, the guns feel briefly and eerily silent at zero hour, 7.30am on 1st July. Frederick’s battery followed a strict timetable lifting to new targets roughly every 30 minutes, supposedly ahead of the advance made by the infantry of the 63rd Brigade. It was clear by 10am that the infantry could not get further than Lozenge Wood. On the morning of 2nd, Lt. Arthur Cecil Colmer, of ‘A’ bty, was killed while assisting men in no man’s land. Late in the day the 96th RFA batteries responded to an SOS signal from Lozenge Wood at 11pm neutralising an enemy counter attack. The infantry of the 21st Division had in fact suffered terrible losses on the 1st July 1916. The official casualties suffered by 10th West Yorks attacking just north of Fricourt were the highest in the British Army for a single day throughout the war – 22 officers and 688 other ranks. Only one officer remained alive at the end of the day, and he was wounded. 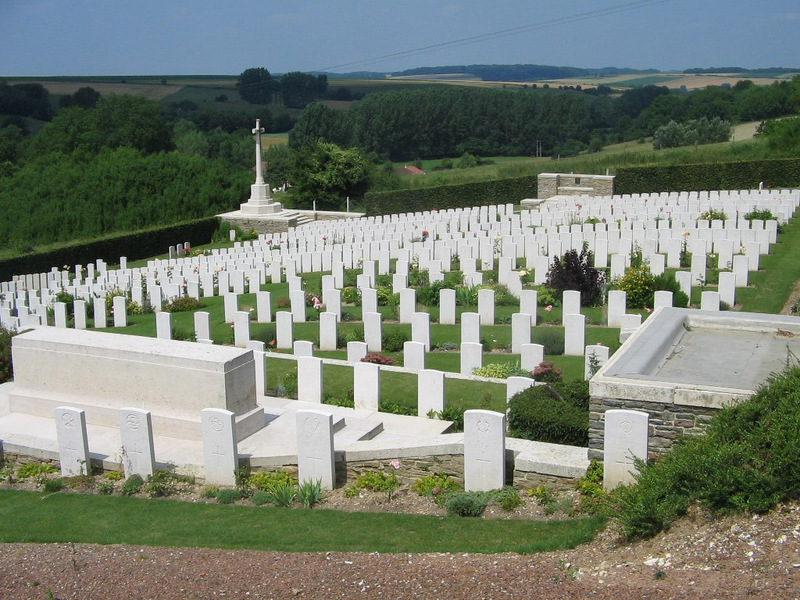 The 21st Division suffered 4256 casualties (making it the seventh worst-hit Division out of 16 used on the day). 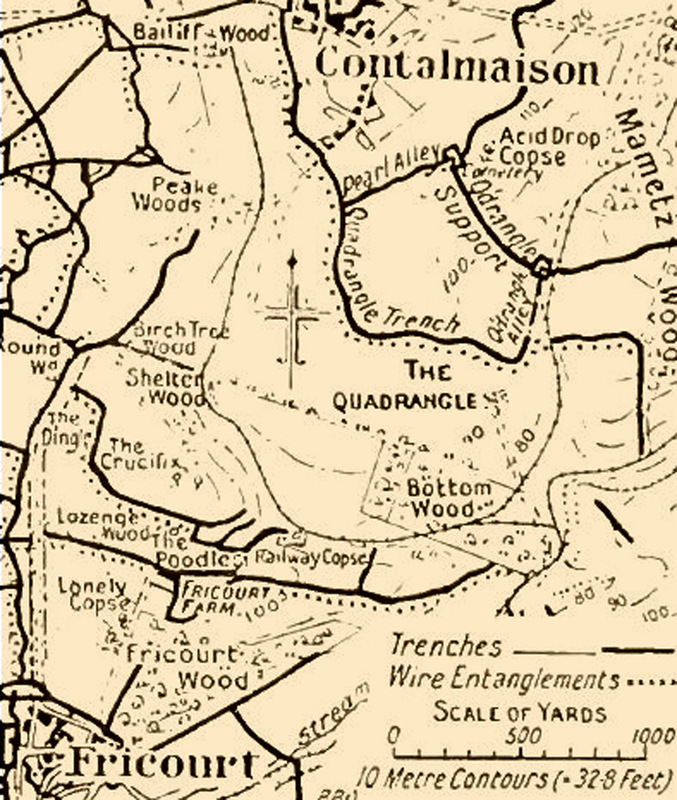 The enemy abandoned Fricourt Village and Wood on the 2nd July, and elements of the 63rd Infantry Brigade held parts of ‘Crucifix Trench’ and ‘Fricourt Farm’. It was thanks to the battery’s forward observation officer, and his men, that any information at all was relayed back to both the local artillery and infantry commands. On the 3rd July, Frederick’s howitzer battery shelled Shelter and Birch Tree Woods in support of the infantry. Lt. Michelle Amoroso of ‘D’ bty. was killed that morning, caught up with the infantry near Railway Alley. After a costly fight, with local commanders using their own initiative, both objectives were taken. Bottom Wood was taken by units of the 17th Division on the same day. Frederick’s battery continued shelling German positions as the fight extended north of Bottom Wood at the Quadrangle and Acid Drop Alley. On the 12th of July, Frederick’s Howitzer battery moved at night to the valley east of Bottom Wood. 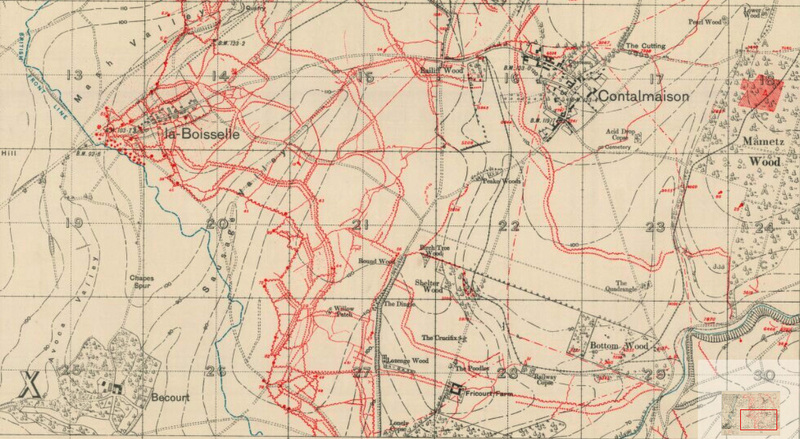 Preparations were being made for an assault by the 21st Division on Bazentin-Le-Petit planned for the 14th July. The troops had assembled in no man’s land at night. The attack was proceeded by a 30 minute hurricane bombardment commenced at 3.20am, followed by a barrage that crept forward of the attacking infantry. By mid-morning all of the 21st Division’s objectives were secured with relatively light casualties. Frederick’s battery continued to shell various targets until relieved on 24th July, one month after the opening of the Somme bombardment. In the period between 24th June and 24th July 1916 Frederick’s RFA Brigade casualties were two officers killed, and nine wounded including one medical officer. Ten other ranks had been killed and 43 wounded. Among the dead who Frederick may have known were: 47068 Gnr. Alfred Leonard Towersey of ‘D’ battery from Camberwell, KIA on 6th July and 47037 Bmdr. Richard Charles Howard of ‘D’ battery, from Walworth, KIA on or since 6th July. The 21st Division returned to the Somme in September in bad weather. On the 13th, Frederick’s howitzer battery was positioned in front of Bazentin-le-Grand and was initially attached to Corps Artillery for counter battery work. The 21st Division was to take part in a large-scale renewal of the Somme offensive on the Courcelette to Flers line. It was here that the Army would use its new secret weapon for the first time, the Tank! This phase of the Somme battle was to last from the 15th to 22nd September. Frederick’s battery was returned to divisional command on the 16th September. Very wet weather reduced operations on the 18th and 19th when only light enemy shelling was reported. The 96th RAF Brigade War diary for all of September 1916 consists of just one page. The casualties are listed as one officer killed and three wounded, other ranks 9 killed and 27 wounded. 47076 Sergeant Frederick Buckland’s war had come to an end. He was killed in action in unknown circumstances on 19th September 1916, somewhere near Bazentin-le-Grand, France. He was buried in the cemetery at Bottom Wood, just over a mile from where he died. Frederick’s remains would not be recovered until after the War, Bottom Wood was lost in the German Spring Offensive of 1918 and not recaptured until the last 100 days of the conflict. 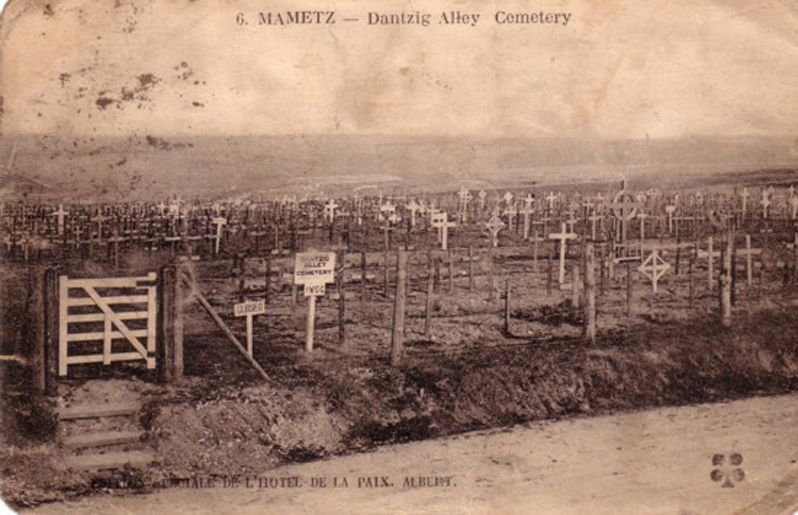 Frederick was re-buried in Dantzig Alley British Cemetery, Mametz. Back home, Bertie and Jemima Buckland received the War Office communication of their son’s death, knowing Frederick’s older brother Francis was yet to go overseas. Any hope that the Somme offensive would bring the decisive breakthrough was beginning to dwindle, and no end was in sight. When victory finally came in 1918, Frances George Buckland returned safely home to his wife and family. He had been promoted to sergeant and served in both 284th and 319th Siege Batteries, manning heavy guns on the Western Front. He was awarded a Criox de Guerre and the Military Medal for what is now some unknown act of valour that took place probably in the Spring of 1918. 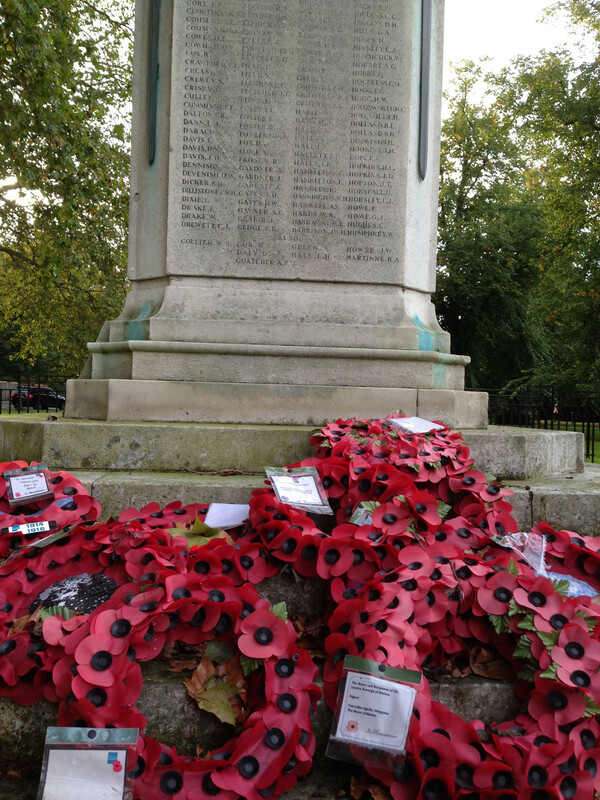 Frederick’s parents ensured their son’s name was added to the Mitcham War Memorial and the Roll of honour in Christ Church near their home in Colliers Wood. Three of Frederick’s younger sisters were married in Christ Church in the years after the War, the name ‘Buckland, Frederick’ would serve as a reminder of the family’s loss. Bertie and Jemima ended their days in Colliers Wood and are both buried in the London Road Cemetery, Jemima on 28 February 1930 aged 62, and Bertie on 19 July 1932 aged 66. Francis George Buckland lived in Garratt Lane between 1919 and 1921 before moving to Lavender Avenue, Mitcham where he and his family stayed for many years. Clifford Harold Buckland, who married in 1919, stayed in the area until his death in 1962. Frederick’s younger brother Donald Edward also stayed in the area until his death in 1952. They are both buried in the London Road Cemetery. But why should Frederick’s name appear on the St. Mary’s memorial? Frederick may have spent ten of his formative years in Summerstown, but the family had been living in Colliers Wood for almost a decade when the memorial was created in the current St Mary’s church. Two documents hint at a possible reason. The circumstances of Frederick’s birth suggest a bond as close as any mother’s with her son. It was his mother, Jemima, that Frederick chose to name as his sole legatee in his soldier’s will. But ten years earlier, on 31st May 1904 an unusual event took place at St.Mary’s Church, Jemima Jane Buckland was baptised as an adult. If St. Mary’s Church had a special meaning to Jemima Jane, then it was only natural she would wish to see her son remembered there too. Brian Norden, nephew of Frederick Sizmur Buckland got in touch after reading the above story. My daughter “stumbled” on your Summerstown website while searching for my uncle, Frederick Sizmur Buckland. What a delight to find so much more information about his RFA Brigade than I had found when I was researching several years ago from Birmingham. Please pass on our thanks to Chris Burge for his outstanding effort. St Nicholas Church, Tooting – Wooden panel (probably in the church hall) photo attached. But before this his father (my grandfather) Bert had made a memorial panel to 12 members of St Nicholas’ choir. And of course his grave in Dantzig Alley Cemetery. I know my mother visited his grave with her father at least once, but there are two sets of photos in her album, dated 1925 and 1930. On the first visit there is only a temporary cross, presumably wooden, with a wreath, which appears to be made of bronze, fixed to it bearing the words “Our Fred”. I guess that this was also the work of his father. The 1930 photo shows the permanent headstone with the bronze wreath positioned in front. It has since been removed as part of “standardization”. “In the great library of strange and moving stories of the war the following one concerning a gallant Mitcham sergeant and his lost ring deserves a conspicuous place. On Sunday last Mr. Buckland had another surprise, and a welcome one. Into his home walked Driver Cook, of Battersea, who declared himself to be of Sergt. Buckland’s gun team. He was home on ten days Christmas leave, and he thought he could not do a better action this gracious season than call on his sergeant’s sorrowing parents and express sympathy. He was full of admiration for the dead man. He knew nothing of the discovery of the ring, but when the matter was mentioned remembered at once that Sergt. Buckland had lost such a thing and a wrist watch as well. He related how a number of men and non-coms had been bathing together and that on the way back to camp the sergeant discovered his loss. He returned on his horse and searched for the things for several hours. Still another surprise. On communicating to the Buckland relative at Hornsey the gratifying result of the quest which she began, she and Mr. Buckland discovered that she and Miss Dawe had formerly been co-workers in the famous Young Life Campaign, in connection with a mission a few years ago. I have attached some photos which may be of interest. As a bonus you have found us another uncle, Leonard Sizmur, who died in infancy – thank you! Bert and Jemima had 12 children in all; they lost another child at under a year old, Bertie William George. Both died from what are now preventable and uncommon childhood diseases – Bertie from whooping cough and Leonard from measles. 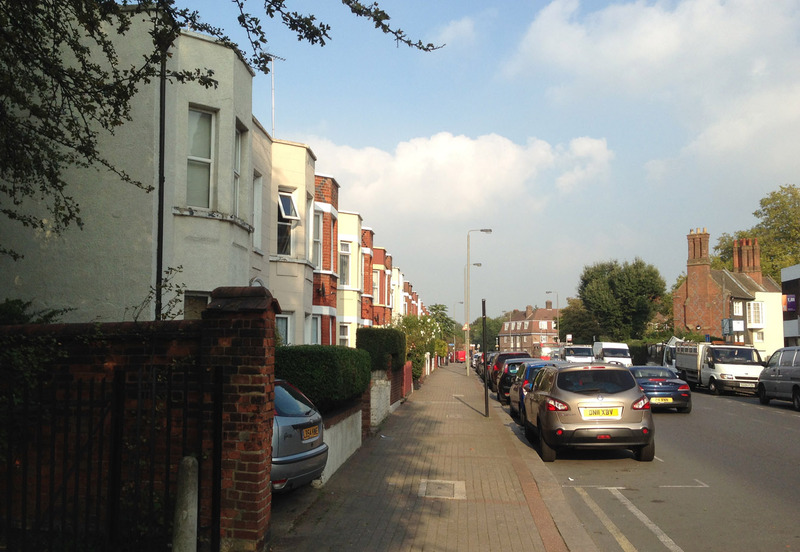 Around a hundred years ago, the two houses next to St Mary’s Church on Wimbledon Road, looking across towards Hazelhurst Road, were inhabited by familes of an artistic nature. Next door at No44 were the Bucklands, whose ten children, five sons and five daughters, included the magnificently-named Frederick Sigmur Buckland of the Royal Field Artillery who was killed on the Somme. Bertie Buckland was a silversmith, or to be more precise a gold and silver embosser and modeller. Not that there was a lot of silverware around Summerstown, but a handy man to have as a neighbour if Reverend John Robinson of St Mary’s wanted anything engraved on a Communion Cup. Their neighbours at No42 were the Abrahams family. Walter Abrahams hailed from the St Luke’s parish in the Clerkenwell area and worked as a pottery-ware enameller. What a glorious vision of artisan life – Bertie working on his silverware nods over the fence to Walter who is just finishing off touching-up the glazing on some earthenware bowls. 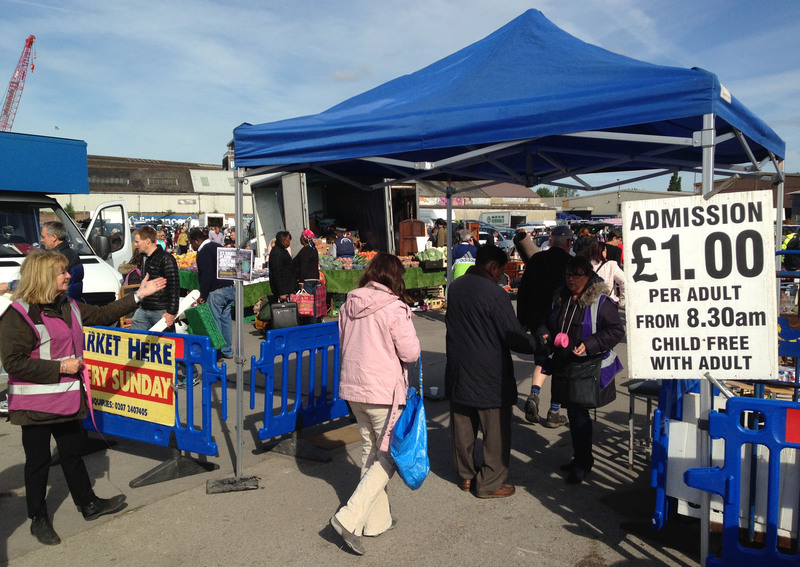 Why, they could even trundle off together down to Merton Abbey Mills market and set up a stall. 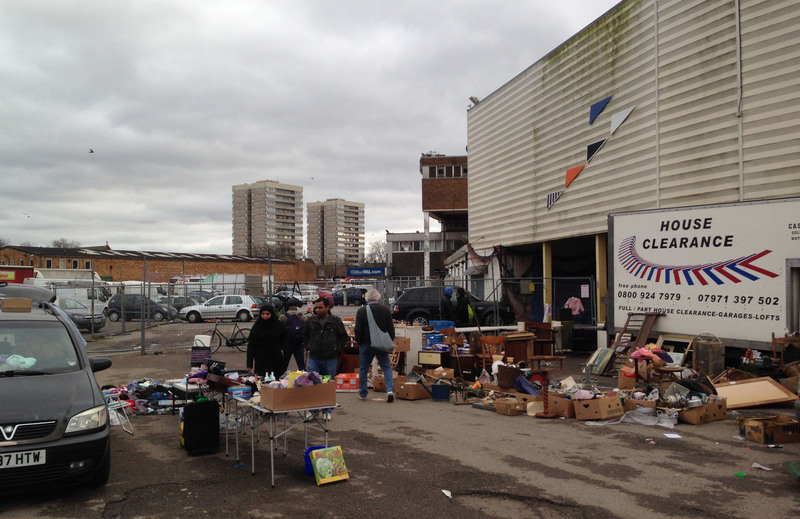 Its just possible that some of the plates and bowls that Walter worked on now turn up in the famous Saturday morning Wimbledon Stadium car-boot sale. Walter and his wife Sarah had two sons according to the 1911 census, Ernest born in Lambeth was twelve and Stanley six. The family then lived round the corner at the Garratt Lane end of Keble Street. No9 was next to the Barnes family. Its currently available to rent for a cracking £2,200 a month though sadly the estate agents couldn’t spell the name right on their website. Thomas Hicks and his brother Harold shared the house with them. Thomas was also a pottery ware enameller and most likely worked with Walter. 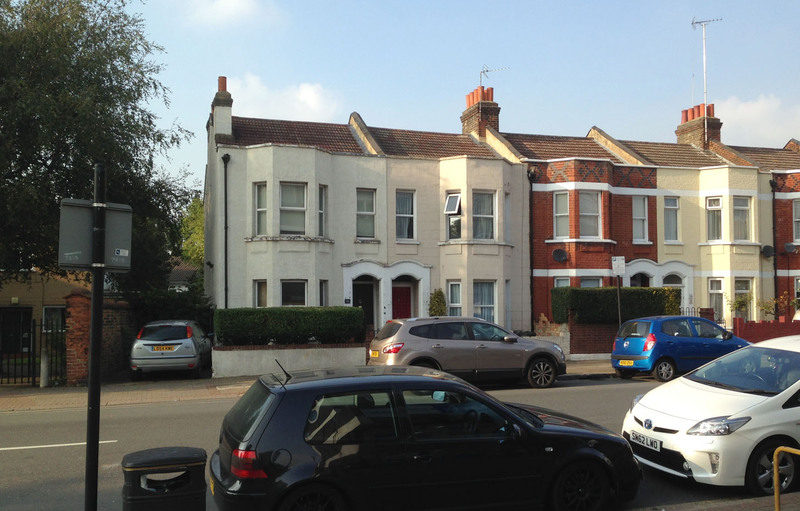 The Abrahams family had moved to Wimbledon Road by 1918 and they were still there in 1930, though having moved a few doors down to No30. In the company of three other members of the Summerstown182; William Pitts, Percy Randall and Alf Palmer, Ernest joined the famous East Kent Regiment known as the Buffs. He was in the 6th Service Battalion which was raised in Canterbury and went to France in June 1915. They eventually became part of the 12th Eastern Division. At the Battle of Loos, 117 officers and over 3,000 men would become casualties, one of these was Percy Randall of Carminia Road, Tooting. The following year the 6th Battalion were involved in the early fighting at the Somme and later at Pozieres. In 1917 its possible Ernest was caught up in the terrible carnage at the Third Battle of Scarpe in which William Pitts from Hazelhurst Road and 250 Buffs lost their lives in the dark of the morning of 3rd May. In 1918 they were back on the Somme and engaged in heavy fighting as the enemy advanced over the old battlefields in their Spring Offensive. The response which was to turn the course of the war and lead to victory began that summer. On 1st July 1918, the 6th Battalion attacked the village of Bouzincourt which was still in German hands. After initial success, a counter-attack drove them back at a cost of 680 casualties. It was on this date, the second anniversary of the first day of the Somme, that twenty year old Ernest Walter Abrahams lost his life. Ernest is recorded as having died of wounds and is buried in Gezaincourt Communal Cemetery Extension near the town of Doullens. 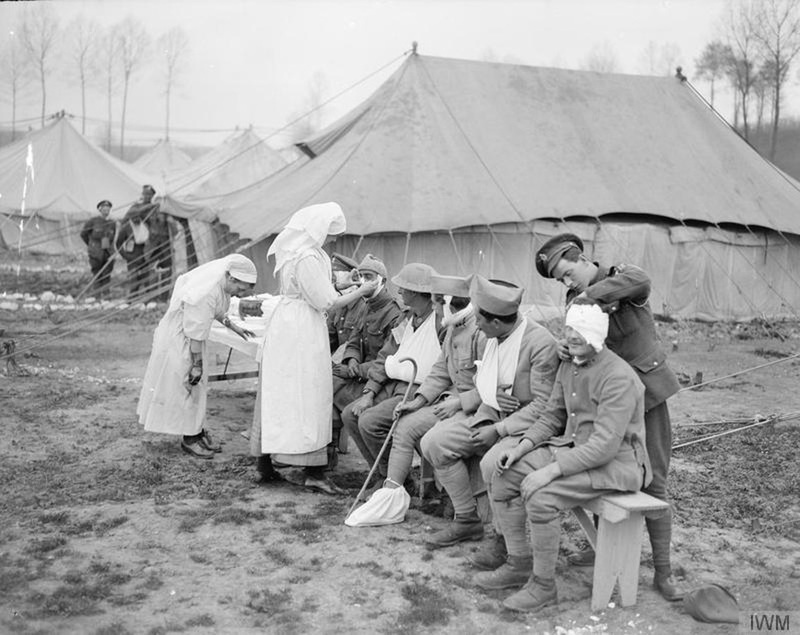 In most cases the burials here were from casualty clearing stations and particularly in the summer of 1918, from the 3rd Canadian Stationery Hospital which was where Ernest possibly succumbed to his wounds whilst being treated. Another soldier with a Bouzincourt connection was the writer JRR Tolkien who was as a 24 year old British soldier, stationed near the village in 1916. 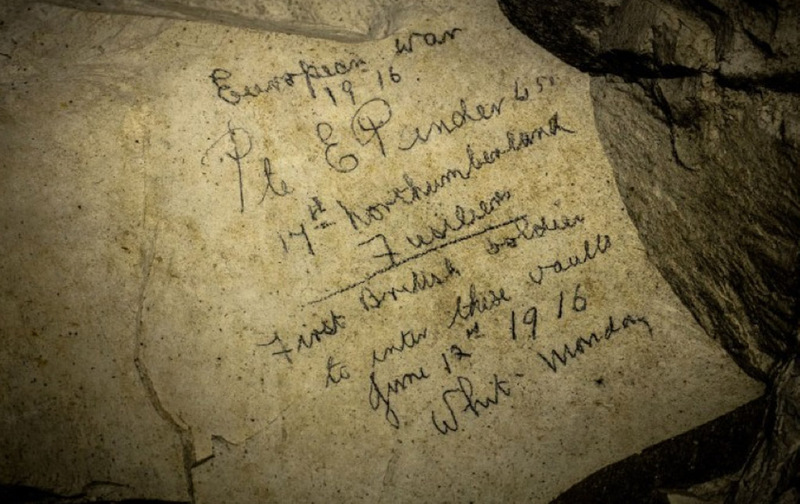 He took part in the nearby Battle of the Somme and wrote about the area in his diaries. Its suggested Tolkien may have visited Bouzincourt’s caves, places where hundreds of soldiers took refuge before the Somme and that some of his impressions ended up in The Lord of the Rings. The names and doodlings of hundreds of soldiers are etched into the chalk as if they had been inscribed yesterday. Its unlikely that two years later Ernest Abrahams visited those caves, but his name lives on, the first on our Summerstown182 roll of honour. 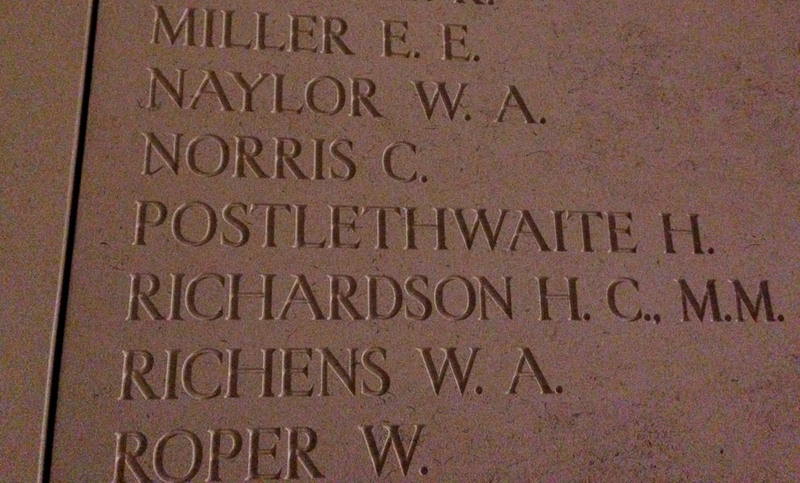 Curiously, although the 182 names are largely written in alphabetical order, he is not the first name on the war memorial itself. Mark Archer, a Royal Fusilier from Burmester Road somehow slipped in front of him and takes that honour.